The first hints that the universe is expanding came in 1917 when Albert Einstein applied his general theory of relativity to the universe as a whole. (In those days, the known universe consisted of just our Milky Way galaxy.) To Einstein’s surprise, his field equations showed a universe which was either expanding or contracting. Since there was no evidence for such a thing, Einstein added his famous cosmological constant to model an eternally static universe – one that has always been and will always be the same size. Then in 1927, Belgian priest and physicist Georges Lemaître — based on his solutions to Einstein’s original field equations, published redshift data, and Edwin Hubble’s distance determinations — proposed the universe is actually expanding. Faced with this compelling evidence, Einstein dropped the cosmological constant from his equations. Some seventy years later two independent teams led by Saul Perlmutter and Brian Schmidt discovered the expansion of the universe is speeding up. 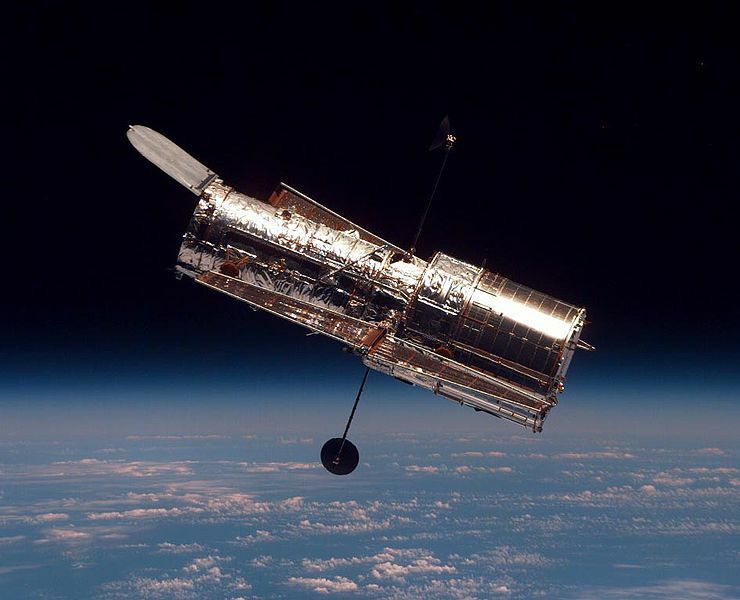 (See Hubble, Keck, and the Nobel Prize below.) The mysterious cause of this acceleration has been dubbed “dark energy”. Einstein had called his cosmological constant “the greatest mistake of my life.” But now a much larger magnitude cosmological constant appeared necessary to model this accelerating expansion. It seems Einstein is such a genius that even when he makes a mistake, he turns out to be right after all – sort of. Assuming dark energy continues to exist in the same amount in the future (a big assumption since we have no idea what it is), cosmological models for a flat universe including a cosmological constant predict the expansion of the universe will continue to accelerate. As a result, some 100 billion years from now all but the closest galaxies will be receding from us faster than the speed of light, making them impossible to see. In a trillion years, generation after generation of stars will have finally used up all the hydrogen and helium gases in the universe. With no more nuclear fuel, stars will no longer form, galaxies will go dim, and matter will consist of dead stars, cold planets, and spent meteorites. In a billion billion years, random collisions of stellar objects will eventually drive many stars to lower galactic orbits. As they circle the black holes at their galactic center, they will give off even stronger gravitational waves. Over time this loss in energy will drive stars closer and closer to the black holes, eventually to be absorbed. Galaxies will then consist of enormous black holes surrounded by dead stars. But be not dismayed — there is still some hope for our universe. In an estimated 10^97 to 10^106 years (that’s some billion billion billion billion billion billion billion billion billion billion billion years), black holes will finally evaporate due to Hawking radiation. And per Hawking’s theory, during the final moments of evaporation, these black holes will become white holes, “pumping new matter into the universe in an unpredictable fashion.” So at least theoretically, our universe will continue to exist in some strange new way. However, predictions for the future of our universe are a very much a work in progress. There are still major questions to be resolved — like what dark energy actually is. Current physics research, including yet to be substantiated theories such as string theory, has the potential to shed new light on both how the big bang came to be as well as the ultimate fate of our universe. But until our understanding of dark energy improves and/or a new theory replaces general relativity and quantum mechanics, the future of the universe remains speculative at best. 1) Michael Way, Harry Nussbaumer, Letters, Phys. Today, Aug. 2011, p. 8. 2) B. Greene, The Fabric of the Cosmos, p. 301. 3) R. A. Freedman, W. J. Kaufmann III, Universe, 6th Edition, p. 661 (including “pumping” quote). I welcome all comments — pro and con. When I had a real job (at a company called Itek Optical Systems), I had the privilege of working on the Hubble Space Telescope studies and the W. M. Keck telescope primary mirror fabrication proposal. As a young engineer, I was so excited to be involved, even in a small way, in the initial stages of these new “eyes on the sky”. I wondered what great mysteries these instruments might some day reveal. Now I know. In 1998, using data from Hubble and Keck (and other telescopes), physicists Saul Perlmutter of Lawrence Berkeley National Laboratory, Brian Schmidt of the Australian National University, and Adam G. Riess of Johns Hopkins University made the most significant cosmological discovery since the Cosmic Microwave Background in 1965. For this, they were awarded the 2011 Nobel Prize in physics. Like so many, their discovery came as a complete surprise. Per cosmological models, physicists in the late 20th century believed gravity should be slowing the expansion of the universe. What was needed was observational data to confirm this theoretical prediction. So in 1998, two independent teams led by Perlmutter (the Supernova Cosmology Project), and Schmidt/ Riess (the High-Z Supernova Search) tried to measure exactly how much the expansion of the universe is being slowed by gravity. And by measuring this “deceleration parameter” they hoped to also get a better indication of the total amount of matter/energy in the universe. Just like car headlights, a supernova appears dimmer the further away it is. So by measuring its apparent brightness as seen from Earth and comparing it to its luminosity, the physicists determined how far away it was, i.e. its distance from us. And since light from a supernova explosion travels at the speed of light c, knowing its distance from us told them how long ago the supernova light was emitted — or when each supernova explosion occurred. Keck and supernova redshift – 13,600 feet high on Mauna Kea in the big island of Hawaii, the ten-meter Keck telescope and its LRES spectrometer were involved in the determination of the redshift of these type 1a supernovae. This told the physicists how much the universe has expanded since the supernova explosions. Say a supernova is 10 billion light-years away. This means it takes 10 billion years for its light to reach us here on Earth. During that time, the universe has expanded — stretching the wavelength of the supernova light as it makes its journey to us. So the supernova light arrives at Earth at a lower frequency — shifted towards the red end of the spectrum. Thus the amount of redshift reveals how much the universe has expanded in the time it took the supernova’s light to travel to the Earth. Together, the data from Keck, Hubble, and other telescopes told Perlmutter, Schmidt, and Riess when each supernova was born and how much the universe has expanded since. The results were shocking, to say the least. Distant supernovae were dimmer than expected. This meant they were further away than initially thought. So their light must have taken longer to get here. Thus these supernovae were born earlier in time than expected. Therefore the measured expansion amounts (redshifts) associated with these distant supernovae occurred earlier than expected. So the universe must be expanding faster than expected. To see this, imagine the surface of a balloon expanding as you blow it up. You expect it to be a certain size at a certain time. But when you measure it, you find it reaches that size sooner than you thought. So, you conclude, the balloon must be expanding faster than you thought. From all this, Perlmutter and Schmidt/Riess concluded the expansion of the universe did slow at first — but for the past 5 to 7 billion years, the expansion of our universe has been speeding up! Later observations of over two hundred type 1a supernovae confirmed this analysis — the expansion of the universe is indeed accelerating. Data from the Wilkinson Anisotropic Probe (WMAP), the Two-Degree Field (2DF), and the Sloan Digital Sky Survey (SDSS) support this conclusion. What causes this acceleration? Physicists have no idea. Some postulate our entire universe is filled with a kind of repulsive energy dubbed “dark energy”. Exactly what this so-called dark energy is remains one of the great unsolved mysteries of modern physics. 2) B. Rosenblum, F. Kuttner, Quantum Enigma, p. 196. 3) B. Greene, The Fabric of the Cosmos, p. 297. In thinking about Jefferson, I wondered what the principle author of the Declaration of Independence (and other founding fathers) would say about our current political climate — particularly the tendency of some politicians to be anti-science. Benjamin Franklin was a scientist and a prolific inventor (amongst many other things). He was the first to label electricity as positive and negative — and the first to discover the conservation of charge. America’s founding fathers were children of the Enlightenment — the 18th century Age of Reason with adherents such as Newton, Locke, Spinoza, Voltaire, and Rousseau. The beliefs of John Locke in particular regarding people’s “inalienable” rights provided the foundation for the governing philosophy of the United States. Enlightenment scholars considered free scientific inquiry and rational thought as the highest form of human activity. Today we find certain politicians challenging evolution, the big bang theory, the age of the universe, and the age of the Earth. These scientific findings are based on rational thought and supported by substantive empirical evidence. They are overwhelmingly accepted by experts in the field as our current best understanding of how nature behaves. Perhaps politicians argue against these tenets of established science because of their beliefs or to court votes. To them I say: I respect your right to say what you will. But your anti-science views are not the principles upon which our great country was founded. Please do not pretend otherwise. Author IM EgdallPosted on October 3, 2011 45 Comments on We the People . . .